Audacity is not a complicated program, so you should be able to pick it up rather quickly. Pick it up for free by clicking HERE! It WILL take a little bit of trial and error to figure out what will work for you personally, but I’m certain that you’ll have it down in no time! In the image above, you’ll see that there are four basic buttons that you should be aware of when beginning with Audacity. They are ‘Trim Outside Selection‘, ‘Undo‘, ‘Redo‘, and the ‘Effects‘ tab. 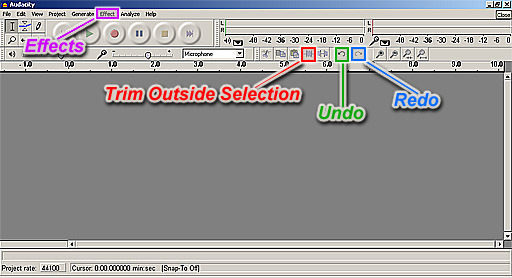 Trim Outside Selection: This is a simple tool that allows you to work with only a small portion of your audio file. It’s basically a ‘crop’ function. Undo: Whatever you just did, you can click this button, and it undoes it. What’s so cool about it is that while other programs limit how much you can ‘Undo’, with this button, you can Undo forever! Redo: Accidentally undo something? Well, click this to Redo it. Simple enough? Effects: This is where you can fool around with your sound file. It has many different things for you to try, but for this tutorial, we’ll be focusing on ‘Amplify’, ‘Click Removal’, ‘Noise Removal’, ‘High Pass Filter, and ‘Low Pass Filter’. To get started, the first thing that you have to do is open your sound file. That’s easy to do. Go up to the top left hand corner of the program, and click the little tab that says ‘file’. When you do that, it will open another menu. The second selection in that new list will be ‘Open.’ Click that and browse to find your sound file, and open it up. The first thing that you’ll want to do with any audio file that you think may have an E.V.P. is listen to it in its entirety. Don’t cheat. REALLY listen to it. When you hear something that you think may be an E.V.P., you’re going to want to separate it from the rest of the file, and get down to bid-ness. If you look below, and to the right, there’s a picture that displays 3 steps to separate your E.V.P. from the rest of your file. Step 1: Find your E.V.P. Step 2: Click and drag your cursor to highlight your E.V.P. Don’t be afraid to highlight more than your E.V.P. You can always do this again to be more accurate. Step 3: Click the ‘Trim Outside Selection‘ button. It’s that simple. If you mess up, just click ‘Undo‘. WARNING: Do NOT go overboard with cleaning your E.V.P. It is VERY easy to take it too far, and completely ruin the integrity of your file. Also be careful not to allow it to sound mechanical or robotic. At the top of Audacity, there are a bunch of buttons in a fashion that you’ll find on pretty much every window on your computer. The first one in the top left hand corner is ‘File’, then ‘Edit’, then ‘View’, and so on. Click the one that says ‘Effect’. The menu will come down with a lot of other choices. I’ve supplied a picture of it for you to the left. I’ve also marked the effects that we’ll be using in this portion of the tutorial. Before attempting to use any of these, make sure you have the section of your audio file that you want to work with highlighted by clicking and dragging on it. This one is going to boil down to trial and error. When you open this window, you will have 2 slide bars to play with. One is called ‘Select Threshold’. the other is called ‘Max spike width’. With this one, all you have to do is experiment with those bars, and see what it does to your audio. You’ll find a setting that works best for that particular file. Noise removal is a little more complicated. The window is pretty self explanatory. It will tell you, ‘Step 1, Get noise profile’. Click that button. Then, highlight the part of the file that has the noise that you want to get rid of. Open the ‘Noise Removal’ window again. Go to Step 2. This is where you should be careful not to make your file sound distorted. Use the slide bar to remove noise. With High Pass Filter, you can remove LOW frequency sounds from your file. With Low Pass Filter, you can remove HIGH frequency sounds from your file. This is a fun toy. With each filter, you’ll have another slide bar, and a field with a number. This number represents your chosen frequency. With High Pass Filter, whatever frequency value is shown in the box, the filter will remove ALL noise from your file that is BELOW that frequency. With Low Pass Filter, whatever frequency value is shown in the box, the filter will remove ALL noise from your file that is ABOVE that frequency. Play around with it. Like I said, it’s a fun little toy. In your effects menu, the first option is called ‘Amplify’. You want to make sure that you always do your cleaning BEFORE you do any amplification on your file. This one works the same way as the others with a slide bar. Just highlight your area, and amplify it. That’s the end of the tutorial. There’s a bit more that can be done with the program. If you want to learn more, I’m sure there are a lot more in depth articles about it on the net, but for E.V.P. work, this really should do the trick for you. If you’re interested, play around with some of the other effects. For being free, it’s a really good program. I hope that this has helped you. Hello I’ve been using the PSB-7 and recording it with an RT EVP Recorder. I have been using Audacity for review. I use get noise profile and noise reduction about 3 times where I hear a spirit trying to speak. And there is a sound like a bad microphone reception kinda sound over the responses. I have no idea how to remove that bad microphone reception sound off of my spirit responses. Can someone please help? I responded to ya on the other post you made on our other page, but I’ll respond here as well. Just try to record again. Sometimes you can’t do anything with a file using software. Based on the classification system that I use, it sounds like you’ve captured a “Class B” recording. I wrote that on our EVP Classification page, and I stand by it. I didn’t think to ask but dose the PSB-7 spit out Different EVPS Ether direction you go with it using AM Foward, AM Reverse, FM Forward or FM Reverse? I’ve only been using 150 FM Reverse. Maybe I need to try other directions with AM/FM Forward/Reverse. Maybe I am doing this cleaning thing right with the noise reduction, High & Low pass and it being it is what it is for having it on FM/Reverse. Maybe I need to try FM Forward or AM Reverse or AM Forward for better results and see what happens after I do noise reduction one time and the High & Low pass filter one time. Maybe it just doesn’t always work right with FM/Reverse. I personally don’t have any experience with the PSB-7. As I’ve stated in other areas of the site, I’m a bit skeptical about those things and the people who sell them, and particularly their ridiculous oversized price tags. Considering that all that it is is a radio sweep, theoretically, the direction of the sweep shouldn’t matter, should it? I mean, you’re generating words in whatever direction you go. Then again, if you’re having problems making the whole thing work properly with your filtering while doing your sweep in reverse, maybe you’re onto something. Reverse might not be the way to go for you. 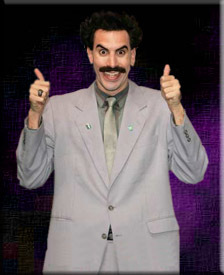 The only real advice I can offer you is stick with what works for you, and improve on it, if possible. Once you got that down, you can always do the opposite, and try new things that are more experimental.